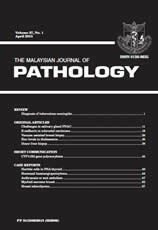 The Malaysian Journal of Pathology is the official Journal of the College of Pathologists, Academy of Medicine Malaysia. The Journal is listed Index Medicus/PubMed, Science Citation Index Expanded, SciSearch, Scopus, the Western Pacific Region Index Medicus (WPRIM), and can be accessed through the Medline online database and its website http://www.mjpath.org.my. All publications are peer-reviewed. Submissions can be made online or sent to the Editor at the business correspondence address below. Authors are advised to read the Information for Authors document, available on the manuscript submission webpage, before submitting a manuscript. The Malaysian Journal of Pathology is published three times a year at an annual rate of US$150.00 (overseas subscribers) and RM150.00 (Malaysian subscribers).